A wave of nostalgia is sweeping Latin America as the 50th anniversary of the death of Che Guevara approaches. 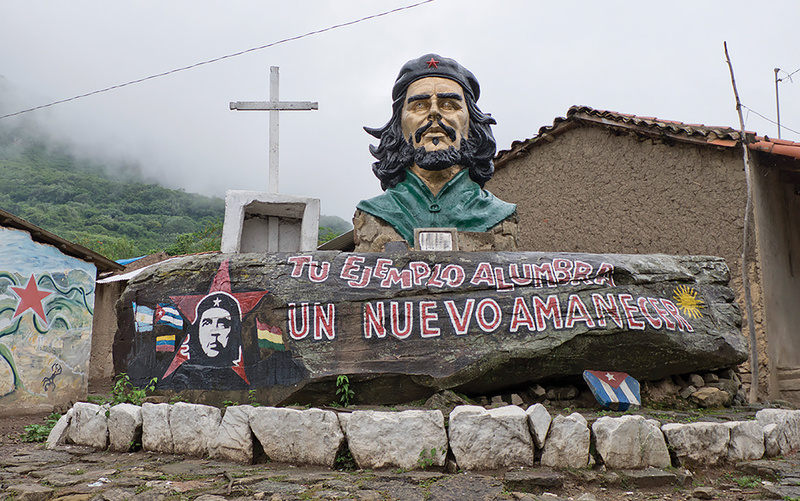 Julio Etchart follows the ‘Che route’ to the remote spot where the revolutionary icon was executed. ‘Your example lights the way for a new dawn,’ reads this monument in La Higuera. The revolutionary army that Guevara formed and trained 11 months earlier is on its last legs. The fighters are exhausted and sick, having been encircled by a superior force of elite rangers trained by the CIA – and repeatedly betrayed by local peasants who were supposed to have joined the revolutionary cause. A few hours after writing his last diary entry, Che was wounded and captured by army soldiers in a deep ravine known as the Quebrada del Yuro (or Churo) in the southern Bolivian Andes. He was taken to a schoolhouse in the village of La Higuera, a few kilometres away. The next day he was executed by a soldier, under orders from the Bolivian army’s high command. Declassified information from the US National Security Archive, including key CIA, State Department and Pentagon documentation, confirms the involvement of the US intelligence agencies, including at least two specialist Cuban-American CIA operatives. One of them, Félix Rodríguez, was present when Che was shot dead. Guevara’s body was strapped to the skids of a helicopter and flown to Vallegrande, a small town 65 kilometres away, before being moved to an open-air laundry in the grounds of a hospital. It was here that the international press was summoned and the famous Christ-like photograph of his lifeless body was taken. Fearing that it might become a place of pilgrimage, the authorities decided not to bury the revolutionaries in the local cemetery. Instead, they were concealed in a mass grave in the corner of an airfield. In 1997 the Bolivian authorities were persuaded to disinter the remains and return those of Guevara to Cuba. From top left: Mural dedicated to Che Guevara in Vallegrande, where his body was taken and displayed to the international press. This is now part of the Che Route, sponsored by the Bolivian government and foreign solidarity groups; The school in La Higuera where Che was killed after being taken prisoner 50 years ago; The 20 or so families living in La Higuera survive on subsistence farming and Che tourism; Julia Cortez, who worked as a schoolteacher in La Higuera in 1967 and fed Che, now runs a grocery shop and restaurant in the village; Mural by the grave of fellow guerilla Tania, who was captured and executed, in Vallegrande. In the build-up to the 50th anniversary of Che’s death, veterans of the Cuban Revolution have erected a mausoleum above the ditch by the side of the airstrip where his bones were found. The school in La Higuera has been renovated and converted into a museum, and the laundry room in the Vallegrande hospital is now a shrine. Visitors leave their mark by scratching their names or thoughts on the plaster wall. Bolivian President Evo Morales, who has a huge portrait of Che hanging in his office, has inaugurated the Ruta del Che (Che Route). For a small fee, local guides take visitors to various sites in the region. A French woman has opened a hostel at the telegraph office in La Higuera where the guerrilla fighters made their last attempt to establish contact with the outside world. Next door, a Cuban ‘internationalist’ teacher runs the local primary school. La Higuera today is a hamlet where about 20 peasant families live off subsistence agriculture… and the legend of Che. A local guide, who holds the key to the old school-house where Che spent his last hours, is keen to show me the rest of the village and introduce me to Julia Cortez. She worked as a teacher at the school and claims to be the last local person to have seen Guevara alive, giving him his last meal – a bowl of peanut soup. Julia now runs a grocery shop and a small restaurant called La Estrella (The Star), after the famous single red star that decorated his legendary black beret. When I request a guide to take me to the bottom of the canyon where Che was captured, I am presented with Efrain, a vivacious 10-year-old who, his mother assures me, knows the way by heart. It takes me a while to negotiate the terrain, which involves a 300-metre descent along a narrow path flanked by thick thorny bushes. The tropical heat is relentless; regular showers make the already muddy trail almost impassable in places. But my young guide keeps rushing ahead. Finally, I have to remind him of one of Che’s maxims: ‘The pace of a platoon is determined by the slowest one in the group’. Efrain understands immediately and adjusts his pace. We reach our destination about three hours later: a desolate ford at the bottom of the gorge on the Ñancahuazu river, where a simple inscription ‘Che vive’ marks the rock where he was wounded before his capture. Climbing back in the intense heat and under a threatening sky – and looking forward to a nice wash, a decent meal and a clean bed – I try to come to terms with the scale of the enterprise undertaken by Che and his comrades. They endured these harsh conditions for almost a year. Exhausted, with little food and no medicines left, their efforts were in vain as they became outnumbered and were hunted down to the bottom of that deep ravine. I belong to a generation that was greatly influenced by the Cuban Revolution. We joined the international barricades to protest against the Vietnam War, the coup against Allende in Chile, and the iniquities of apartheid in South Africa. We protested in anger at the martyrdom of Victor Jara and the long imprisonment of Nelson Mandela; we drew inspiration from people like Maya Angelou and, of course, Che Guevera. But it was not until I put myself, albeit infinitesimally briefly, in his boots, that I finally caught a glimpse of what it takes to make the mind of a revolutionary. Julio Etchart is a Uruguayan-British photo-journalist.